Smashed sweet potatoes with a sweet and creamy maple aioli is what I call a blue ribbon winner! A quick and easy smashed sweet potatoes with maple aioli are perfect for Thanksgiving or any fall dinner. 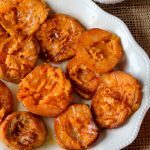 Nothing says Thanksgiving more than sweet potatoes, and these smashed sweet potatoes are a healthier alternative than their fried counterparts. The maple aioli is creamy and rich, with a dairy-free option. 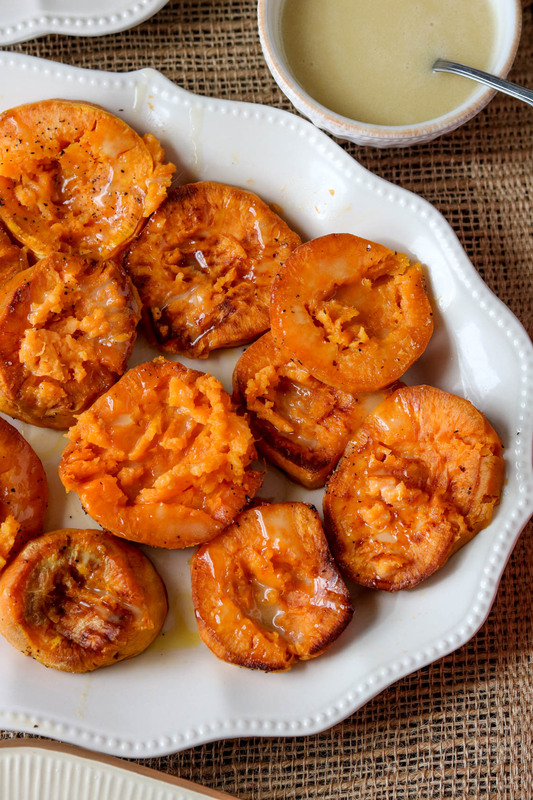 Plus, these smashed sweet potatoes are the perfect gluten-free side dish. I pretty much love sweet potatoes these days. Sweet potato fries, shoestring sweet potatoes, sweet potato hash browns, and these smashed sweet potatoes. 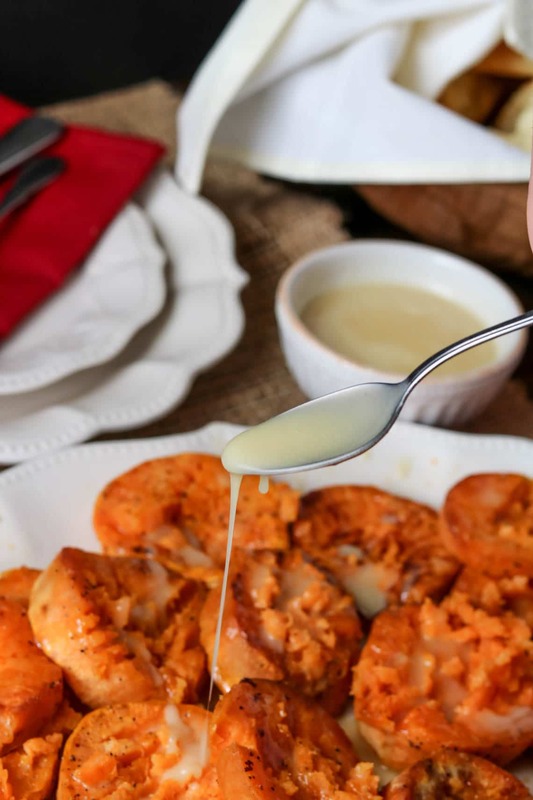 With this recipe, I’ve replaced the traditional fried candied yams covered in brown sugar and marshmallows with these roasted smashed sweet potatoes drizzled with a creamy maple aioli sauce. You’ll still get your sweetened sweet potato dish without the frying. If you still want that crispy outside, you could pop these smashed sweet potatoes into an air fryer and get them nice and crispy on the outside. But definitely not required for this recipe. Sweet potatoes are also an excellent source of Vitamin A, providing over 400% of your daily Vitamin A needs. They are full of fiber and potassium. Sweet potatoes are also a complex carb, which basically means they are made up of fiber and nutrients, they take longer for your body to digest (compared to simple carbs) and the best part….they do not raise your blood sugar like a simple carb would. So there’s no sugar crash when it comes to these carbs. And remember, carbs are NOT the devil, it’s the quality of the carbs and quality of the foods that matter. Complex carbs also provide fuel to your body to be used with energy production. For more information, read 7 Health Benefits of Sweet Potatoes. Keep your sweet potato slices between 1/4 and 1/2 inch. If you want a little crisp to your smashed sweet potatoes, throw them in the air fryer after baking but before smashing. For a dairy-free option on the maple aioli, use a dairy-free mayo. A quick and easy smashed sweet potatoes with maple aioli are perfect for Thanksgiving or any fall dinner. Nothing says Thanksgiving more than sweet potatoes, and these smashed sweet potatoes are a healthier alternative than their fried counterparts. The maple aioli is creamy and rich, with a dairy-free option. 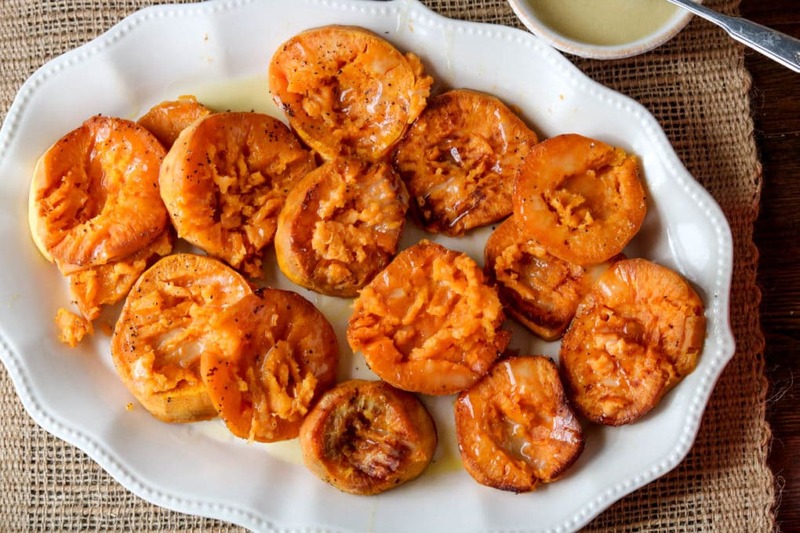 Plus, these smashed sweet potatoes are the perfect gluten-free side dish. Slice the ends off each sweet potato and discard. Slice the remaining into 3/4 in. slices and place onto a lined/greased baking sheet. Drizzle olive oil over all slices and sprinkle with salt and pepper. Use a pastry brush to thoroughly brush oil and spices over all slices. While sweet potatoes are baking, combine aioli ingredients into a small mixing bowl and whisk together. Cover and store in refrigerator until ready to serve. Remove potatoes from oven and using a fork, lightly smash in the center of each disc and transfer to serving platter. Serve maple aioli on the side and drizzle as much as desired. Try these other sweet potato recipes.